Blame the Genes - The truth about food and medicines. One of the most revolutionary discoveries in recent years has been the unravelling of the human genetic code. Gene therapy is now the buzz word; so much so that it has become a dominant factor in the treatment of disease. Vast sums of money have and are still, being poured into genetic research. This type of research employs hundreds of scientists and researchers who are convinced that many of the diseases that inflict mankind are as a result of faulty genes. They have thrown common sense to the wind and to quote Dr. Walter Yellowlees, one of the founders of the McCarrison Society for Nutrition and Health, ‘they go down ever narrowing corridors and get into ever more deepening bogs of complexity of bio-chemistry’. One wonders how mankind ever managed to survive with so many apparently faulty genes in our body makeup. As Dr.Natasha Campbell-McBride points out in her book ‘Gut and Psychology Syndrome’, almost every health problem is now commonly blamed on genetics. This is a popular concept as it conveniently shifts the blame from the patient onto something else. Regardless of his lifestyle, it allows the patient to shrug his shoulders when he becomes ill and claim it is his rotten luck to have inherited ‘bad genes’. Dr. Natasha remarks ‘If we look at all the epidemics of degenerative disease we have in our modern times which are blamed on genetics, it is easy to come to the conclusion that we must all have very poor genetics indeed. ……according to the scientific establishment, genetics are pretty much to blame for every misery we suffer. We have epidemics of cancer, heart disease, diabetes, psychological and psychiatric maladies, learning disabilities, autoimmune disorders, obesity, etc. etc., the list is long. These are all conditions which doctors very rarely encountered 100 years ago.’ Furthermore, despite all the money spent on genetic research none of these conditions so far has had any proven genetic cause linked to them. It is obvious, of course, that our genes could not have changed in so short a time to cause these epidemics. Surgeon Captain T.L.Cleave was quite clear in his book, ‘The Saccharine Disease’, that while hereditary defects do occur, the struggle for existence, as happens in the evolutionary process, keeps these failures very rare indeed. 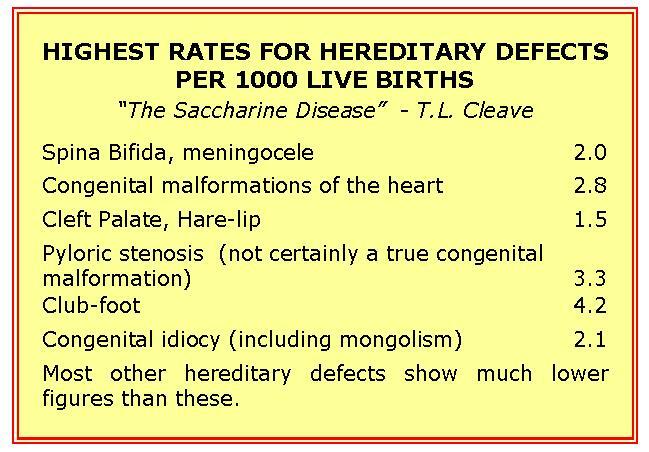 According to Cleave, hereditary defect does not exceed 5 per 1,000 live births. Cleave maintained that ‘If the incidence is many times as great as that of any known hereditary defect, then, quite apart from other considerations, such a cause for the ailment becomes extraordinarily improbable.’ In other words these incident figures indicate whether a disease is due to hereditary defect or rather to a new factor in the environment. It poses the question as to whether the body has been built wrongly or is being used wrongly. Cleave gives the example of hallux valgus, or bunions as they are commonly called, and explains that feet with well formed big toes have no structural defect; far from it! They may be particularly efficient in certain natural circumstances such as long marches or jumping from one piece of rocky ground to another. The problem arises when these feet are squeezed into pointed shoes that they were never designed to wear. This demonstrates how a new factor in the environment can cause the deformity and not that the feet have been built wrongly. Referring to diabetes type 2, Cleave says ‘…its incidence in many populations far exceeds the figure of 5 per 1000 which the author has already shown represents the upper limit of incidence in hereditary defects, he rejects unequivocally that diabetes is for practical purposes ever primarily caused by hereditary defect.’ He acknowledges that some people may inherit a certain physical make-up of the pancreas and related structures which can make them unduly vulnerable to a new factor in the environment so that they acquire diabetes, but he stresses ‘this is utterly distinct from hereditary defect’. Cleave warned that there was a grave danger that the hereditary features in diabetes would distract from the external factor in the environment, which he said ‘is the primary cause and the only thing that really matters’. Scientists have become so excited by the advent of gene therapy that they have sometimes allowed themselves to be led down a blind alley. One glaring example is associated with cystic fibrosis. Since 1989 researchers have been trying to find and isolate the gene that they believe is responsible for this fatal disease when in fact some doctors believe it is not a genetic disease at all but a congenital one, meaning a health condition that is present at birth but not necessarily inherited. Grants and other funding have been poured into gene research for cystic fibrosis. Dr.Joel Wallach, an American veterinarian, discovered while working with rhesus monkeys at the NASA experimental laboratory at the Yerkes Regional Primate Research Centre, that the disease was caused by selenium deficiency in the mother. The diagnosis was based on characteristic cystic fibrosis changes in the pancreas and liver in baby monkeys. He was able to reproduce these same changes in almost any animal species by depriving the mothers of selenium, thereby proving that it was NOT a genetic disease. Dr. Wallach claims that not only is it preventable but it is 100% curable in the early stages in laboratory animals. After several decades of research the elusive gene responsible for cystic fibrosis has not been found and yet Dr. Wallach claims that this disease could be virtually wiped out by the addition of selenium to the diet of vulnerable pregnant mothers such as those living in areas known to be deficient in this essential mineral. Statistics reveal that more than 10,000 people in the UK suffer from cystic fibrosis. Dr. Natasha relates how at one time medical professionals suspected that faulty genes caused stomach ulcers, gastritis and stomach cancer. However, after the remarkable discovery that the Helicobacter Pylori bacterium was the cause of these particular disorders, suddenly the faulty gene connection was dropped because the real culprit had now been found. Dr Natasha used this as an example to show how easy it is to blame genetics in order to fill a gap in scientific knowledge. She remarks ‘Genetics are a very convenient scapegoat. Wouldn’t it be wonderful not to worry about our food, environment or our lifestyles? Wouldn’t it be so convenient to just put all the responsibility for our state of health on our genetics?’ She points out that we take no account of the way we have polluted the water we drink, the food we eat, the air we breathe, and the soil we deplete, not to mention the toxic chemicals regularly used in the form of pesticides, organophosphates and weed killers. Then we wonder why we fall ill and blame it on bad luck or inherited bad genes. Genes give us predispositions to certain diseases and we all have certain disease risks according to our individual genes and makeup, but what we CAN do is to reduce these risks to a minimum by providing our bodies with the best possible environment and that means the best possible nutrition. Dr. Natasha Campbell-McBride "Gut & Psychology Syndrome"
Surgeon Captain T.L. Cleave "The Saccharine Disease"
Dr. Joel Wallach "Dead Doctors don't lie" chapter "Monkey Business." T. Colin Campbell and Thomas Campbell II "The China Study"